It was wonderful to receive a visit from this man today, who we supported a few weeks ago. He came to thank us for the enormous difference our support had made to his life. 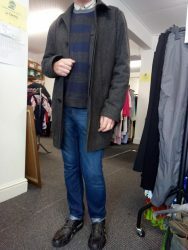 He has managed to be rehoused and needed bedding etc but what he was most delighted about was the fact that every item of clothing he was wearing today, from head to feet, was supplied by us on his last visit. Having appropriate clothing enabled him to keep appointments that have led to him being rehoused. It was wonderful to see him seeming like a very different person to the one who first came to us for support. We told him he looked very hipster! THIS is the difference your donations make! Please call 07724 118666 in office hours wed to fri to arrange donations of winter appropriate clothes. We especially need scarves, gloves, hats and new underwear of all ages and sizes. Thank you for helping us to support others in transforming their own lives.